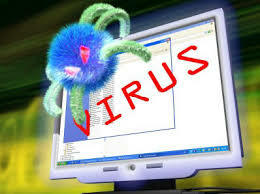 Nowadays a lot of viruses -viruses that appear, both local and foreign. Indeed, many are also anti-anti-virus can detect the virus, such as local pc Mav-famous in the virus-virus membumihanguskan local. But sometimes the virus is also a lot of - the virus, both local and outside the "recalcitrant" as difficult as once detected antivirus database that is used may not be it, or in other words anti-virus database is less quickly by the creator of the virus. 1. Your computer is running slower than usual. 2. Menu Run, Search hidden by the virus. 3. CTRL + ALT + DEL can not be used. 5. Original folders on your computer hidden and replaced with a file virus. 6. Menu Tools -> Folder Options missing in Windows Explorer. 7. Computer frequently stops responding or not. 8. Computer suddenly restart or crash, and this happened a few minutes once. 9. Computer application is not running properly and often error. 11. Hard drive or disk drive can not be accessed. 12. Summary print does not work properly. 13. Often happens that strange error message and does not usually. 14. Often visible menu or dialog box that is damaged. 15. There is duplication in the name of the folder in the folder. 16. Always remove the computer from which the message originated this virus.